The Scole Group, also known as the Scole Experimental Group, was a group of sitters in Scole, Norfolk, England who produced a wide range of dramatic physical mediumship phenomena from 1993-1998. The Scole Group believed it had come together specifically to work with a spirit team to pioneer a new creative energy, other than the traditional ectoplasm, for transdimensional communication. This new energy was a combination of natural earth energy (augmented by a ley line running through Scole), human energy, and spirit energy. The group was investigated for two years by three senior members of the Society For Psychical Research, acting on their own behalf. The investigators found no evidence of fraud or deception, but did find evidence favoring the existence of intelligent forces, whether discarnate or originating from the human psyche, which could influence material objects and deliver visual and aural messages. – the first to investigate a range of tangible physical phenomena not associated with ectoplasm and which could be examined outside of the seance room. When the investigation results were publicized, the case immediately became controversial. The Scole group was initiated by Robin and Sandra Foy, both experienced as sitters in physical mediumship and well-known in Spiritualist community. Robin Foy was especially interested in the direct voice mediumship of Leslie Flint. On April 21, 1990, Foy was participating in a physical development circle. A new spirit named Noah Zerdin spoke in a direct voice and urged the creation of an educational society for the promotion of “safe physical mediumship.” Soon afterwards, Foy founded the Noah’s Ark Society, which has helped to form private circles and groups worldwide. In August 1991, the Foys moved from Postwick to Scole. They transformed a basement room into a completely dark place for their circle to meet; it became known as “the Scole Hole.” Four members from their group in Postwick agreed to come to Scole to continue the mediumship work. The purpose of the sittings was to try to obtain irrefutable evidence of survival after death and to perform experiments that would produce repeatable, successful results. The cellar was inaugurated in1993. Sittings were in the dark. When sitting with visitors or investigators all of the group wore luminous wristbands so that their movements could be monitored despite the dark. Little happened, however. The group went through changes in membership, finally arriving at six members, all of whom were new except the Foys. Two were Alan and Diana Bennett, both of whom discovered they could become entranced in the sittings. Eventually the group decreased to the Foys and Bennetts, all of whom became mediums for the spirits. In 1993, physical phenomena developed. Dancing lights appeared, the sitters were splashed with water and touched, there were strange noises and movements of objects. A spirit guide who announced himself as “Manu” served as control–or gatekeeper as the spirit preferred to be called–for other spirits. Manu said he had had many incarnations on Earth, the latest in South America. A spirit named John Paxton, from the 13th century, explained to the sitters that they would be working with new and safer energies made up of a blend of Earth, human and spirit energies. Other members of the spirit team and their alleged pseudonymous identities included Mrs. Emily Bradshaw, a charity worker from Oxford; Edward Matthews, who died in World War I; Patrick McKenna, an Irish priest who loved Guinness and fat cigars; Raji, an Indian prince; and a group of scientists. Phenomena rapidly increased. There were more than 100 different types, among them apports, materializations of walking forms, direct voices, levitations, raps, luminous pillars of light and ringing bells. The most striking phenomenon of all the sittings was light activity. For example, a single light would dart around the darkened cellar at great speed, even entering a crystal to light it from within. It would change shape, activate ping pong balls, make sharp sounds when it hit the table, and irradiate and levitate crystals and Perspex bowls. The spirits instructed the group to try photographic experiments by snapping pictures with a camera on command while the supernormal lights danced around the room. The camera also took pictures by itself. Among the photos produced were an image of St. Paul’s Cathedral during the bombing blitz of World War II, and the front page of the pre-WWII Daily Mirror newspaper. The spirit team also allegedly transmitted images onto factory-sealed film not loaded into any camera. The spirits often described phenomena accurately before they occurred. 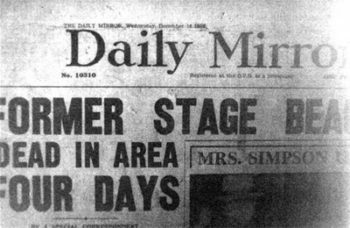 One apport that appeared in 1994 was a pristine copy of the Daily Mail newspaper dated April 1, 1944. The newsprint was determined by subsequent independent chemical analysis to be of war-time origin and the copy was printed on letterpress, an obsolete method. The Scole group sometimes allowed visitors–as many as 25–to attend sittings. Many witnesses testified to the phenomena that occurred. Most of the sittings took place in the Scole Hole. In 1995, 1996 and 1997, the group went to Ibiza in the Mediterranean at the invitation of psychical researcher Hans Schaer, and conducted sittings there. After losing contact with their regular communicators, the group ceased sitting in November 1998 at the instruction of new communicators, following severe interference. 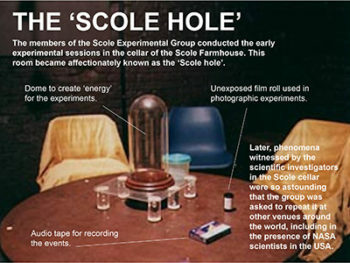 In 1995, the Scole group agreed to allow investigation by three psychical researchers who were members of the SPR: Montague Keen, Arthur Ellison, and David Fontana. Between October 1995 and August 16, 1997, the investigators were present at 18 sittings, which lasted about two-and-a-half hours each. Other witnesses, including prominent members of the SPR, attended some of the sessions: Ralph Noyes, Archie E. Roy, Alan Gauld, Donald West, John Beloff, Bernard Carr, Hans Schaer, Robert Morris, Ivor Grattan-Guinness and Rupert Sheldrake. The spirits imposed specific requirements, conditions and restrictions on all experiments, and declined to do some experiments, such as the book test, which they said was “old hat” and had not swayed scientific opinion. They declined to allow any external light at the sittings, as well as infra-red equipment. The only means of detecting movement were the luminous Velcro-adhering bands wrapped around the wrists of the sitters and on the table, and occasionally on pieces of equipment, and also the varying levels of apparently supernatural lights. However, the spirit team did seem concerned about having safeguards against fraud, and a few were proposed by the investigators. The spirit team engaged in extensive consultation with the investigators, and agreed to work with plastic security bags for film, and to switch from Polaroid to Kodachrome film. Investigators also took their own precautionary steps to mark film tubs and their locked box before and after the sittings. Not all the experiments were successful. There were trials and errors, and a learning curve from them. The investigators followed the spirits’ instructions for protocols, sometimes reluctantly. They made no body searches or nor placed physical constraints upon the mediums, as has been done in past investigations of mediums who worked with ectoplasm. The sitters were allowed to sit next to one another, while the investigators all sat on the opposite side of the table, rather than interspersed with the sitters. The spirits specified that background music be played during sessions (though often they asked for it to be turned down or off, or changed to create a different mood). Most procedures for detecting fraud had to be discussed first with the spirits before they could be employed. Of particular interest–and controversy–are the results of the photographic experiments, in which the spirits allegedly impressed a variety of images upon undeveloped and sealed film. The investigators desired a four-step protocol: use of their own film; use of their own secure container to house the film during sittings; their control of the container during the sittings; and their control over the developing of the film. These were not always consistent with experimental nature of the film work. Sometimes the spirit team required the film to be left alone for several days–reportedly in a secured container–in order for them to accomplish their work. Some of the results were obtained in sittings in which the investigators were not present. The wooden security box designed by a son of one of the sitters proved to be insecure. Keen devised a new one. 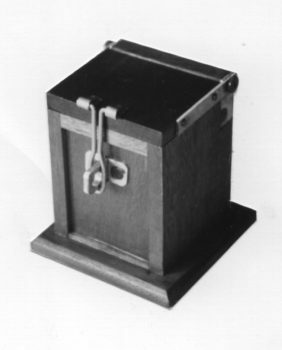 However, the photographic phenomena did not occur in any film placed in the “Keen box,” although some from the group’s box were successful when it was both locked and hand-held throughout by an investigator. –a host of drawn alchemical symbols. 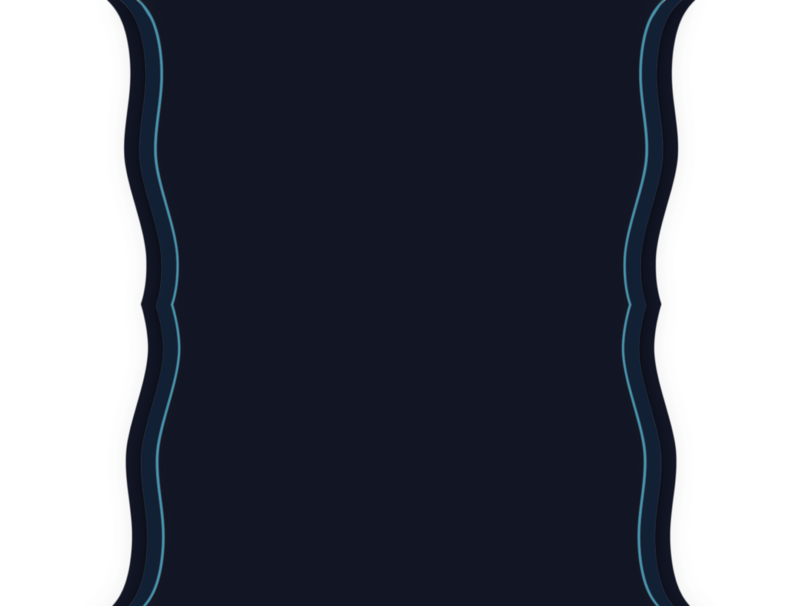 –written Latin phrases, including mirror-image script. –portions of a poem in German script. The German film was produced under “perfect protocol” ruling out fraud, according to investigators. –fragments of handwritten amendments of an early version of the Ruth poem by William Wordsworth, from a rare and little-known manuscript, in what resembled Dorothy Wordsworth’s handwriting. –part of a poem written by Frederic W.H. Myers, one of the founders of the SPR, and a quote from his book Human Personality and Its Survival of Bodily Death. –a script which read “Can you see behind the Moon” followed by the name of Louis Daguerre, the pioneer of photography. 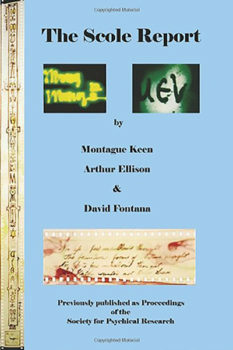 The “Daguerre script” was the last to be produced for the investigators. In the spring of 1997, Keen accompanied the Scole group to California to a series of invited sittings. The last major experiment involving the principal investigators was on August 16, 1997. Keen had asked the spirits for spirit messages that could be taped and would enable them to distinctly hear independent spirit voices. Besides messages, a rendition of a composition by Rachmaninoff was transmitted by the spirits, a piece which had great personal significance for Keen. This significance was not known to the other investigators or the sitters. After that sitting, the investigators were informed that the spirits wished to move on and do other experiments, and felt that sufficient evidence had been presented in order for the investigators to write their report. Following the end of the investigation, the Scole group reportedly obtained images on videotape with the use of a psychomanteum. Schaer had total control of a new videotape inserted into his camcorder in light conditions, and found intelligible images on it. By 1998, plans were made to present the group’s evidence to the public in films and in a book. New experiments were planned. But on November 23, 1998, a new communicator explained that contact had been lost with the ‘Team’ and that further communications must cease. The reason given for the halt was that the experiments had caused “space-time problems relating to an interdimensional doorway” that had been created for the experiments. The vortex of the group’s energies within the doorway had attracted experimenters from the future, whose work was interfering with the Scole work and making it increasingly more difficult for the spirits to communicate. Specifically, a researcher from the future experimenting with a “crystalline time-probe” had intentions that were not so benevolent. The group disbanded, but plans went ahead for publicity and publication of the book and the investigators’ report. The lack of strict protocols on all experiments brought criticism from skeptics, who pointed out that many of the illustrations produced on the filmstrips looked as though they could have been drawn with a human hand, and the majority of them came from published sources that were available, though not readily. The investigators countered that fraud would have been extremely difficult and risking almost inevitable detection. The Scole Report, issued as a Proceedings of the SPR in November 1999, observed that the sitters had no motive for fraud. They had earned a nominal amount of money giving sittings and seminars for fee, but had also worked for no compensation, and had even declined an offer of financial assistance from the SPR. Any deception would have had to have been meticulously orchestrated in pitch darkness, would have required sitting with eyes open rather than closed and would have necessitated clearly detectable movement of the luminous wrist-straps. –the various phenomena produced–especially the lights and the film impressions–were not necessarily paranormal, but also could be done normally. –the constant background music required by the spirits could mask movements and noises. –the luminous armbands, attached with Velcro, were easy to remove. –the film canisters themselves were never marked for identity, only the plastic containers in which they came. The investigators nonetheless concluded that they had obtained evidence for genuine phenomena. They ruled out imagination, preconception and exaggeration on their parts, and asserted that few if any of the light phenomena could have been produced even with elaborate equipment. The only alternative to genuine phenomena was fraud, and they had detected no direct evidence that fraud was committed, nor had they ever had any suspicion of fraud. They acknowledged that they had been unable to achieve “watertight conditions under which fraud would have been rendered impossible” in their experiments. Do comprehensive research in advance. Watching a single YouTube video and away you go is not enough. 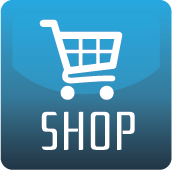 The publications noted below are essential reading, along with the Basic Guide. For the best chances of success, you need grounding in context, which includes the history and details of how Scole operated and was investigated. You also need knowledge of the spirit world and mediumship in general. Choose your sitters wisely. People who think it would be “fun” and “entertaining” are not the best candidates. Serious research requires a serious commitment, not participation when it’s convenient. 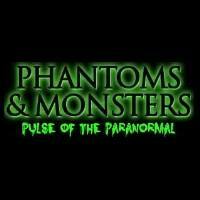 People whose only knowledge of the paranormal comes from television likewise are not the best candidates. TV is entertainment. Choose mediums wisely. Mediums who think it is a sign of competence to perform a “floppy tuna act” when spirits are present are not the best candidates, either. They are imitating the entertainment drama they see on TV. Serious research requires a steady mind. Persevere. Mediumship groups can sit regularly for a long time before the energy clicks and phenomena start happening. Do not give up if there are no or few immediate results. Reality TV has conditioned people to think that results are immediate and dramatic. The true reality is a much different picture. Nonetheless, the research can be quite rewarding. This article was adapted from The Encyclopedia of Ghosts & Spirits 2nd edition by Rosemary Ellen Guiley. A Basic Guide to the Development of Physical Psychic Phenomena Using Spiritual Energy. The New Spiritual Science Foundation, n.d. available at www.thecoleexperiment.com. Solomon, Grant and Joan. The Scole Experiment. London: Piatkus, 1999. Updated edition, Campion Books, 2006. Keen, Montague and Arthur Ellison and David Fontana, “The Scole Report.” Proceedings of the Society for Psychical Research, 58(1999): pp.150-452. Google “The Scole Experiment” and “The Afterlife Investigations” for a list of YouTube features.